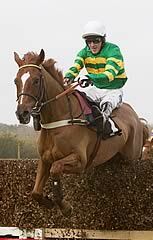 Distance may not be so important to Uxizandre, all-the-way winner of the Shloer Chase, but direction is. "He's won up to three miles, so there are plenty of options there," said the six-year-old's trainer Alan King. "But we are restricted the way he goes. He jumps to the left, always has, so the key is that he has to go left-handed." Uxizandre finished second to Taquin De Seuil in the JLT Novices' Chase at The Festival before winning the Grade One Pinsent Masons Manifesto Chase at Aintree, and opened this season with a fourth place back at Aintree. 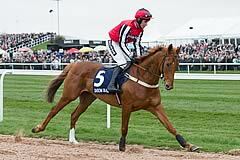 "He was a bit keen at Aintree, though I had a great ride," said Geraghty. "Today was just great, he settled so well. He's a gorgeous horse. He loves it up front and I was happy all the way. He absolutely pinged the second last." Uxizandre, at 15/8, notched a 13/1 double on the day for rider Barry Geraghty after Vyta Du Roc (3/1) in the Sky Bet Supreme Trial Novices' Hurdle, and also a second win on the day for owner JP McManus, after David Pipe-trained Unique De Cotte (7/2) in the opener. His next target may be the Dial-A-Bet Chase at Leopardstown at Christmas. "I'd imagine he'd be back here in March," said King, "though whether for the Queen Mother Champion Chase or the Ryanair I wouldn't be sure, but it's a nice problem to have. "We've learned how to ride him now. If he gets crowded he can disappoint but up there in front he really enjoys himself. He doesn't get keen, he just bowls along with his ears pricked. Maybe one day we'll try him again right-handed, but not yet." Trainer Nicky Richards was happy with Simply Ned after the 4/1 shot finished a gallant second this afternoon. The seven-year-old jumped well under jockey Brian Harding and was bang in contention as the field turned for home. Although he couldn't quite get to the winner, he battled really well up the home straight to finish the length and three quarter runner-up, a head in front of Dodging Bullets in third. "He's run a grand race," said Richards. "I think better ground would have suited him but that's probably the case for all of them. He's a real battler and tried hard but the winner kept rolling all the way to the line. "You can't quicken off this sort of ground and he's a horse that's got a good kick on him. "He's run a good, solid race though. He needs to go this way around (left-handed) so that'll rule out races like the Tingle Creek. I've half got the Dial-A-Bet race in mind (at Leopardstown) for him and we could go there next. "There's always the Newbury race as well (Game Spirit Chase) but that's not until February. "He's not short of speed and I'd hope we'll be back here in March for The Festival - that's what we're all in the game for. On good ground though, I wouldn't be against running him over further at Aintree though in the spring."